우정아는 국적과 국경에 관한 질문을 던지며 예술가의 사회적 역할을 고민하는 작가이다. 미국으로의 이민을 계기로 이동과 순회의 작가로 알려진 그는 누구나 쉽게 만들고 접어서 이동할 수 있는 로프트(LOFT)를 만들었다. 바느질로 조각 천들을 이어 붙여 만든 로프트는 작은 여행 가방에 넣어 이동이 가능하며 설치 시에는 바람을 이용해 가볍게 부풀려 거대한 크기의 구조물로 변신한다. 작가는 스스로를 공간을 만드는 사람이라고 말한다. 땅을 차지하고 들어선 무거운 시멘트 건축물과 대비되는 로프트는 움직이는 공간이다. 로프트를 경험하는 것은 문화적 혜택을 받지 못하는 소외된 지역에도 빠르게 대중의 참여와 소통을 이끌어 낼 수 있는 문화 공동체의 공간을 만들어내는 것이다. 예기치 않은 장소에서 사람들은 거대 파빌리온을 경험하게 된다. 하루 아침에 자신 앞에 서 있는 커다란 구름 같은 조형물, 공기를 불어 넣어 만들어진 거대한 공간에서 사람들은 자신의 몸이 작품의 일부가 되고 함께 창작하며 로프트의 생명을 이어가게 된다. 즐거움 참여, 사람의 숨결이 작품이 되는 이 작업은 우정아의 신 파빌리온이다. 작가는 개인주의가 만연한 현대사회에서 사회 참여와 공동체 문화의 공감대를 이끌어가는 작업을 계속 해오고 있다. 로프트는 작품의 공간뿐만 아니라 관객의 참여가 핵심이 되는 작은 공동체의 놀이이고 축제이다. 로프트의 밤과 낮은 확연히 다르기 때문에 설치 되어 있는 동안 사람들은 시간과 공간의 변화에 따라 특별한 경험을 할 수 있게 된다. Jung A. Woo addresses questions about nationality and borders, while considering the artist’s role in the society. As a result of her immigration to the United States, she became an itinerant artist and developed her interest in portable spaces that are shaped by the communities she finds herself in. 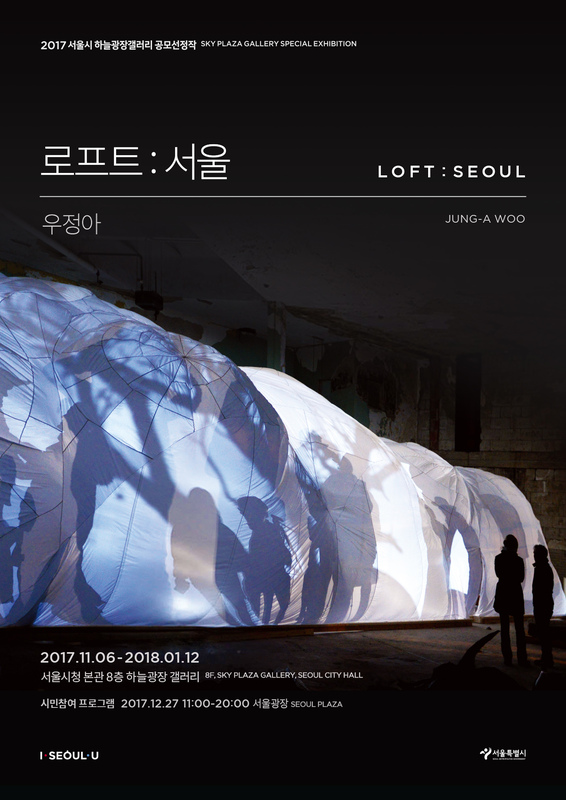 For the public art project in Seoul, she created LOFT, an inflatable architectural structure that can be quickly erected, becoming a new community space, that can just as quickly be collapsed, folded, put into a small travel bag and transported to the next location. Through the installation of this portable space within a community, she intends to provide art experiences to members of the public who may not have access to cultural experiences or opportunities to engage in the art making process. Community members get to encounter this new and unexpected place that has altered the familiarity of their day-to-day environment. Once inside this cloud-like structure made just in a day, participants are allowed to share creative ownership of this public art performance and engage in artmaking or in collaboration with one another. The experience of LOFT is largely defined by the community members’ culture and preferences, how they collaborate with one another, and also the time of day as it largely influences the visual aesthetic of the space. During the day it is creating dreamy spaces that people can enter quietly, spaces that inspires introspection and wonder. At night, the atmosphere inside and around the sculptures are transformed into an illuminated festival of light and movement, as individuals explore the space and become part of the installation. 밤에는 신기한 그림자를 만들며 재미있는 체험을 해보세요. 별도의 예약 없이 누구나 참여할 수 있습니다.별도의 예약 없이 누구나 참여할 수 있습니다. Using the map of Seoul as its inspiration for the LOFTs design, you are invited to step inside and enjoy its airy tranquility during the daytime. In the evenings bring your friends and family and your presence, energy, and creativity will be projected onto the walls of the LOFT. You can join us without any reservation in advance. In the event of rain, the program can be postponed. Jung A. Woo studied painting at Sookmyung University in Seoul, South Korea, and earned her B.F.A. in Sculpture and Ceramics from the New York State College of Ceramics, Alfred University in Alfred, New York, and her M.F.A. in Sculpture from the School of the Art Institute of Chicago. In the USA, she has been continuously working on collaborative community-based art projects engaging audiences’ participation. She visited Korea for the first time in 25 years to carry out the LOFT project in Yeouido Hangang Park and Seoul Plaza in front of Seoul City Hall.